I read this article and found it very interesting, thought it might be something for you. The article is called 0.02% New Cars Are Electric. Here’s What Govt Must Do To Reach All-Electric Goal and is located at https://archive.indiaspend.com/cover-story/0-02-new-cars-are-electric-heres-what-govt-must-do-to-reach-all-electric-goal-78119. Delhi: The 2018 edition of Auto Expo showcased some 50 electric vehicles (EVs), reflecting the buzz created by the government’s proclaimed intention to sell only electric cars by 2030, to both reduce vehicular pollution and curb India’s dependence on petroleum product imports. The displays signalled the industry’s capability and eagerness to tap this new market. Just 0.02% (4,800) of all new cars sold in India in 2016 were electric. In contrast, as many as 2.5 million conventional cars are sold every year, and a matching sales figure for EVs hints at a huge market. Based on road transport minister Nitin Gadkari’s announcement that a policy dedicated to promoting and regulating EVs was in the works, EV manufacturers and sellers were expecting a policy and regulatory framework laying out a roadmap for creating an ecosystem comprising, most importantly, charging stations, as well as rolling out incentives for both manufacturing and purchasing EVs. On February 16, 2018, the heavy industries ministry issued a draft National Auto Policy for discussion, acknowledging the importance of green mobility but referring to EVs as just one among several alternatives such as vehicles run on biofuels, CNG and hydrogen. No specific timelines for targets, infrastructure building and incentives for any of these were outlined, and, most worryingly for EV makers, no plans were specified for aligning India’s flagship EV programme, Faster Adoption and Manufacturing of Hybrid and Electric vehicles (FAME), with the overall electric vehicle vision or with the domestic manufacturing programme, Make in India. “We are trying to figure out what went wrong,” an official from the Society of Manufacturers of Electric Vehicles (SMEV) told IndiaSpend, requesting anonymity. SMEV represents Indian manufacturers of electric vehicles and component makers. A mandate guiding the switchover to EVs is definitely required to speed up production, he added. The government’s volte-face created near panic among EV makers, and analysts agreed a dedicated policy was essential. “The country needs a clear road map with timelines and role play on transition to electric vehicles, else it will just remain a dream,” said Amit Bhatt, strategy head for integrated urban transport at World Resources Institute India (WRI India), a think-tank. EVs have the potential to disrupt the mobility ecosystem, Bhatt said, adding that if the transition is done well, it can positively influence employment generation and the wider economy, in addition to addressing two most pressing issues of our time–air pollution and climate change. Here’s a look at how the government can remove speed-breakers from the road to scale-up of EV production and uptake. To kickstart the EV market in India, the state-run Energy Efficiency Services Ltd (EESL)–renowned for speeding up use of LED lights by bringing prices down 80%–has been trusted with the job of creating demand. In September 2017, EESL floated a tender to procure 10,000 electric cars to replace government vehicles in and around Delhi. Tata Motors Ltd won the contract, although it has not yet started manufacturing. By April 2018, EESL is looking to float another tender for procurement of 10,000 more electric cars. Almost a year ago when the central government announced an intention to ensure all new vehicles on the road from 2030 would be electric, the International Energy Agency (IEA), a Paris-based think-tank, had said the target was too ambitious. The draft National Auto Policy instead says nothing about the all-electric-by-2030 target, but sets the central and state governments a procurement target of 25% EVs from 2023 and 75% from 2030. It sets the municipal corporations of metro cities a more challenging target–50% EVs from 2023 and 100% from 2030, as per a Bloomberg BNA report dated February 21, 2018. If the switchover happens for 100% intra-city commercial transportation and 40% of personal transportation by 2030, the country would be bringing over 50 million electric cars on its roads in less than 15 years, a 2017 study by IEA said. However, the EV industry’s performance so far does not make it seem up to the task. Just 25,000 two- and four-wheeled EVs were sold in India during 2016-17, 80% of them two-wheelers, according to a December 2017 study conducted by the Society of Manufacturers of Electric Vehicles (SMEV), which represents Indian manufacturers of electric vehicles and component makers. Electric cars accounted for only 8%. China started promoting EVs around the same time as India–a decade ago. While India’s EV stock grew 11-fold from 370 cars in 2008 to 4,800 in 2016, China’s grew by more than 1,300 times to reach 648,770 cars in 2016, up from 480 cars in 2009, said the IEA study. 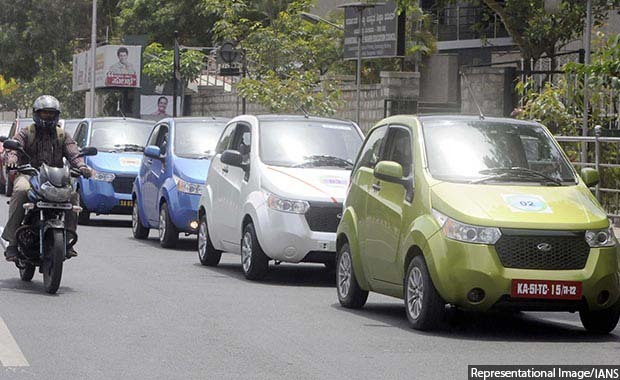 Electric cars’ market share in India as we said, is below half a percent, as per the same IEA study. India’s electric cars’ share stood at 0.02% in 2016. China recorded more than 40% of the total global EV sales. Worldwide, EV sales have picked up over the past two years. The global electric car stock surpassed 2 million vehicles in 2016 after crossing the 1 million threshold in 2015. More than 750,000 new electric cars were registered worldwide in 2016, a record. Some of the top car makers worldwide–Maruti-Suzuki, Hyundai, Tata, Mahindra and Mahindra, and Nissan–have announced plans to launch electric cars in India by 2020. India currently imports 80% of its fossil fuel requirements. With a sharp increase in vehicle numbers, the IEA projects that three-fourths of the projected future increase in oil demand will be from the transportation sector. EVs have a potential to save fossil fuels worth Rs 6.3 lakh crore ($100 billion) annually, a government statement published by the Press Information Bureau (PIB) said on March 27, 2017. The savings would be 10 times the country’s health budget. “Which in turn would save the country precious foreign exchange, prevent the dependence on imported petroleum products and reduce the pollution in cities by 80-90%,” the statement said. EVs are estimated to produce up to 90% fewer emissions than conventional internal combustion engines of petrol- or diesel-powered vehicles, as per SMEV estimates. India can save 1 gigatonne of CO2 emissions by 2030 if it were to have only electrical vehicles, according to a November 2017 study by the Federation of Indian Chambers of Commerce and Industry (FICCI), an industry association, and the Rocky Mountain Institute, a U.S.-based think-tank. This would significantly help slow down the speed at which the world is warming up and causing catastrophic events such as heatwaves, floods and erratic rainfall. Bangalore Electricity Supply Company Ltd. (BESCOM), a Karnataka government utility, became the first in the country to start an EV fast charging station on February 20, 2018. It is planning to open 11 more such stations across the city within three months. A few other states including Maharashtra, Gujarat and Rajasthan and the union territory of Delhi are planning to install such stations in the coming months. India has 350 public EV charging stations, compared with around 57,000 petrol stations, according to a July 2017 report by Bloomberg New Energy Finance, a consultancy. The lack of charging infrastructure is one of the biggest hindrances for the growth of EVs on Indian roads. To accelerate the creation of charging infrastructure, the government must resolve a number of issues, many of which such as power generation, distribution, transmission and trading involve amending the Electricity Act of 2003. For instance, the law prohibits resale of electricity. This can restrict private-sector participation in creating charging infrastructure, Bhatt of WRI told IndiaSpend. This is because electricity is distributed by mostly state-owned distribution companies. The government is thinking of doing away with this stipulation by modifying the law. The other model would be for distribution companies to directly sell power to charging-station operators or create their own charging-station franchises. It is “quite an interesting situation” for electricity distribution companies (DISCOMs) because charging infrastructure opens up a new revenue stream for them, Shantanu Jaiswal, head of India research at Bloomberg New Energy Finance, told IndiaSpend. “DISCOMs should not do things because the government is pushing, they should actually start thinking ahead,” he added. Charging infrastructure could be required to supply 160 billion units (BU) by 2030, according to a 2018 study by Coal India. This is the amount it takes to power 1,700 million households for a month. India generated 1,107 BU of electricity in 2015-16, according to government data published by the Press Information Bureau on December 23, 2016. The government is also planning to bring a separate policy to boost the number of charging stations, news website The Print reported on February 26, 2018. For now, charging stations will be treated as a service, power minister R.K. Singh said. Treating charging stations as service providers would remove the need for a legislative amendment, but industry insiders say this is only a stop-gap arrangement. “The service model can be considered for a short period of time until the number of vehicle remains low,” the SMEV official said. EESL has set up 125 charging stations in the National Capital Region of Delhi, taking the number of charging stations in the region to 300. It is also planning to float a tender to erect 2000 charging stations across the country. If EV sales match up to the government’s expectations, India’s electricity distribution network would have to be prepared to handle the demand surge from charging stations. Quick-charge facilities, in particular, may overburden parts of the grid, requiring a substantial revamp, especially in congested urban areas, Anish De, head of infrastructure strategy and operations at KPMG India, a financial and business advisory firm, said in a January 16, 2018, interview to Bloomberg News. However, this need not be a deal-breaker. If all the vehicles in India are to be electric, the load on the grid will increase by only about 20-25%, Kedar Soman of PluginIndia, a portal focused on the promotion of EVs, said. Since this increase is going to be gradual, the grid does not face imminent collapse. “I think the extra load caused by electric vehicles will increase at a reasonable pace for the grid to adapt,” he said. However, the time of day when people are allowed to recharge their EVs and the pricing incentives that could be built into the system to regulate this behaviour would be important. Millions of EVs on the road would mean millions of batteries to store electricity for the run. Expensive batteries are among the biggest challenges for EV manufacturers, accounting for more than half an EV’s cost, Bhatt said. While the cost of batteries has been falling consistently, it must reduce further for EVs to compete with the conventional internal combustion engines (ICEs) used in petrol and diesel vehicles, Bhatt said. Lithium battery prices have seen a 58% drop in the past few years, from $600 (Rs 38,500) per kilowatt-hour (kWh) in 2012 to $250 (Rs 16,000) per kWh in 2017. The EV industry is betting on a further drop in battery prices to $100 (Rs 6,400) per kWh by 2022-24, which will bring EV prices closer to petrol and diesel vehicles’. “It will be impossible for people to buy a Rs 5 lakh car if that becomes a Rs 20 lakh car,” Kenichi Ayukawa, managing director and chief executive officer of Maruti-Suzuki India, India’s largest car maker, told Mint in a January 17, 2018, interview. Maruti-Suzuki, which plans to launch its first electric car in India in 2020, is looking for lithium suppliers for a lithium-ion battery plant in Gujarat and is working with its dealers to set up charging networks, Ayukawa said. SMEV has on several occasions asked the government for incentives to boost production and purchase of EVs. Greater tax rebate and per-vehicle monetary support are two of its primary demands. It has also asked for tax rebates and front-loaded subsidies during the initial years of a vehicle’s purchase and use. However, road transport minister Nitin Gadkari has said the incentives provided by the tax rates under the goods and services tax (GST) regime are good enough. “There will be no incentives. We believe the market will give good incentives because people are aware of pollution and realise how cost effective EVs are. A good quality product at a reasonable price doesn’t need to be marketed,” Gadkari said at a private event on January 20, 2018. The GST Council had set a 12% tax rate for EVs, compared with 28% for petrol and diesel cars. Industry experts disagree with Gadkari’s pronouncement, pointing out that consumers will not buy EVs as long as their upfront cost is significantly higher than conventional vehicles’. “[We need an] incentive structure offering a subsidy of Rs 5-6 lakh per car at least, to truly help EVs compete against ICT engine cars,” said the SMEV official, referring to internal combustion engines used in conventional-fuel vehicles. Currently, the government is providing a subsidy of Rs 1.24 lakh per car and charges 12% GST, which makes the actual subsidy only about Rs 24,000-25,000. This is definitely not enough, the official added. To make the structural change that the automobile industry is being asked to, the industry does need subsidies and incentives at least for now, Jaiswal of BNEF agreed, adding that as demand grows and prices of components such as batteries fall, subsidies and other incentives may no longer be required. Many governments around the world have propped up their EV sectors with incentives. California state in the United States mandated in 2012 that a specific percentage of vehicles sold by each manufacturer would be zero-emission vehicles (ZEV). It also introduced tax rebates for EV manufacturers as well as buyers. Later, many states in US adopted this model. China has also mandated that its manufacturers produce a certain number of vehicles. It has also introduced many national subsidies, awards and tax rebates for the industry. Since EVs use electricity, they will be no cleaner than conventional vehicles as long as the electricity they use is generated from fossil fuels. As of now, renewables comprise just 18% of India’s installed capacity. Stricter emission control norms for coal power plants and a fast-growing share of renewables in the country’s electricity generation capacity will create a cleaner grid, experts believe. In 2017, renewables capacity addition outpaced coal for the first time in India. The year 2018 is likely to be the last when coal capacity installation exceeds renewables’ because a lot of projects delayed in 2017 will get completed, Jaiswal said, citing BNEF research. Thereafter, the pipeline of new coal plants will become narrow, while more and more renewable projects will get commissioned, turning the grid slowly and steadily greener and cleaner. Update: The story has been updated to show that the efficiency of EVs has increased to 90%, according to recent estimates from the Society of Manufacturers of Electric Vehicles.